At what point do the Dutch start putting out red notices for these creeps? When a conversation is retrieved in a full forensically sound chain of evidence in which an actual command has been given to a Buk operator on a specific timeline and a specific location. These are not available, are they? (This is true for all SBU intercepts). Many, many conclusions as drawn in this article actually lack any sound back-up. For example not even a rigged court could ever take over the proposed chain of argumention that the man on the tapes=Khmuryi=Dubinsky=”Bad”= a sound confession which could triangulate the story as displayed on the SBU tapes. Indeed. So far we don’t know the voice is Khmuryi, we don’t know Khmuryi is Dubinsky, we don’t know Dubinsky is ‘Bad’, we don’t know the recordings are not fakes. Meanwhile, bellingcat fulfils its MH17 posting quota for the month. Meh. You are the kind of guy who could look at multiple videos of the same buk convoy deep in rebel territory and claim (like Putin, his generals, and reb leaders) that there is no evidence that rebels have a buk. A reasonable person should acknowledge what the most likely scenario is – especially given the range of evidence from Girkin admitting his people did it (warned you not to fly in our sky) to videos to audio to physical evidence. The presence of buk doesn’t mean it fired Boeing. The fabricated SBU records don’t mean the finger pointed people are responsible. Usually there should be an investigation first based on objective evidence, and only then one can start blaming. Presumption of innocence, no collective responsibility – the principles the west announce and always violates. What is your opinion about the statements from the Russian government about about the downing of mh17? The Russian government is sure that Ukraine is responsible for the downing of MH17. Did they have the evidence that proofed that Ukraine is guilty about MH17? The term objective evidence, you use, does not excist. You can talk about evidence that is correct or false evidence. Objective and subjective are person related opinions. You should not talk about reason, CFL68, because thats a concept that obviously is alien to you. First: we don’t know how authentic these videos are. First of all because there is no certainty about date whatsoever. Furthermore all of them show problems, inconsistencies. Take the Snizhne video: the timing from a shadow casting analysis does not fit the timeline and the video is not datable by means of deep third party investigation. It is almost incomprehensible you again start spreading the Strelkov “don’t fly in our sky” disinfo campaign the SBU helped disseminating at the evening of the crash. Even pro-Bcat investigator Greidanus has confirmed for all of you this story was a hoax. Because the Chernukhino tapes are also blatantly faked – as even Bcat and JIT should admit by now, but don’t – the first two building blocks to spread a story of a separatist mistake are clearly fabricated. What could that say about the dissemmination of tweets and imagery at the same date, stuff that can be linked to a tiny group of very staunch pro-Kiev sources? Bcat even features MASH in this article again, the informant/reconnaissance volunteer who is the same person that videoed the Zuhres video but later claimed in front of cameras he took it on another day. I have to agree. the article repeatedly says “it seems” , it “may have” and other such wordings that make it clear that they aren’t sure about anything at all. But then they use all these doubtful pieces of information and then declare they know for sure what happened. Let it be noted that there never was any confirmation of this (Ukrainians hitting Snizhne on July 15). In fact, Ukraine denied hitting any target on July 15. Instead, this may very well be an attack by the Russian air force, preparing Snizhne to place an air defense systems like a BUK, to “protect” them, while in fact the only reason was to shoot down MH17 from a location where the BUK would be appreciated. Ukraine has declared many times that they were not flying on July 15, because one of their planes had been downed July 14 near the Russian border, and the fate of the pilots was still unknown. So again, who made the attack on Snizhne July 15 ? Who believes official Ukraine? They bombed own Snezhnoe and denied that. IF any Russian jet was there, could you imagine what YELLING would be raised ranging from Poroshenko to NYT and WP. There were NO any Russian jets in Ukraine for all the war. Who believed Russia after all the lies ? Nobody believes nobody. Im just saying it would be ridiculous to take for granted the official statements of Ukrainian side as an evidence. ou have yet to point out a single lie out of Ukraine on MH17. I’m saying about the war actions at Donbas. MH17 is a completely different topic. For MH17 I would never ever believe Ukraine turned off all military radars and civilian primary ones on the 17th, as they claimed to DSB to justify why they didn’t provide any primary radar data. Also Ukraine said there were not military flies on the 17th because allegedly their jet was shot down at the high altitude on the previous 16th. But there are peoples witnesses they heard Ukrainian jets even on the 17th. You still did not identify a single lie by Ukraine, while many lies by Russia have been exposed by media outlets, especially Bellingcat. If it were a Ukraine fighter on July 15 attacking Snizhne, Russia could easily show radar images (which according to Russia are able to detect even a small drone at that distance) to expose the Ukrainian lie. Yet that never happened; not a peep from Russia on this incident. Which means that the Ukrainian claim that a Russian fighter bombed Snizhne in the morning of July 15 still stands, and Bellingcat cannot use it as evidence against Ukraine. The interesting part is that if this was a Russian false flag attack, that the Russians choose Snizhne as the place where they wanted to place a BUK. Why Snizhne ? For one, it is close enough to the Russian border for direct communication with a BUK command unit. After all, you don’t hand over a BUK TELAR and tell the separatists to have fun with it, and shoot at anything that moves. Man, it seems you are working none stop, 9 to 5 in both languages (I have red your posts in russian-speaking comments section. You can continue to undermine clear evidences of russian involvement in killing of 300 of passengers, invent ukrainian SU 24 planes or putin’s plane as a target… You even can deny presence of russian weapons and soldiers in Crimea and Donbass. Your slavish co-citizens will believe you without any prove (they are afraid of learning how deep into trouble your junta have gotten them) and rest of the world will not believe you ever again after nonstop lies… Keep working, comrade! You’re making that up, Rob. Even the NYT analysed the attacking plane flew very likely west-east, considering the missile strike damages. And so far the few witnesses reported low flying, which is indeed the usual Su-25 attack vector for ground targets (while releasing flares against SAM). No way the normal Russian radar picked that up! On the other hand Ukraine would have likely picked up any west approach as that would have brought the plane deeper into Ukraine and likely in reach of all mobile and fixed radar units and spotters guarding the more active battle zone there. What interests me from the Ukrainian denials is the possibility that the whole of the Air Force was not under a single command at the time and not all missions clocked and booked. However, the impacts (as witnessed by the apartment building on the picture in that publication) suggest a north-south impact (the apartments are positioned east-west). Do you have an explanation for where they obtained their statement that “he angle of the 10 holes punched by the bombs and the direction of the damage indicated that the bomber was flying from west to east. ” ? If I google “snizhne july 15 2014” there are a lot of images of this attack. Can Bellingcat maybe shed a light on this and determine if the attack was west-east or south-north ? It was from a jet so it doesn’t really matter which direction it came from, as a Ukrainian plane could have been on either side. There’s no reason to believe that it was a Russian plane outside of a relatively outlandish comment from a Ukrainian official. Man, how nice to meet so clinical case. 🙂 I write by EST just because unfotunally have a lot of free time now. I have never intentionally said a bit of lie. Give a single citation. I’ve never said nothing you ascribe me here. I’m concerned that Russia is under constant flow of dirt and lies when I know that has nothing to do with reality. What Russia did it did, but don’t ascribe to her what she didn’t do and what you think she really is! (She because Russia is a female grammar gender word in Russian). Really that’s it. If you ever discussed based on established facts and logocal reasoning I would have nothing to add or challenge. But you are not. Look at what you are writing. My co-citizens really don’t need my to explaine anything. Some think more or less as I am, and I hope they are a majority. They are just very disappointed and don’t understand that crap and aggression pouring to Russia from everywhere. The others are strictly against the government and I have nothing to tell them to. Some understand what and why they are doing, some Id say are more deluded or have just nothing to do. If you read Russian you could see what kinds of replies they write me. Ask Aric. So no, even here you are fantastically far from reality, and I’m upset when the same attitude is applied to my country. Aric, we may never be able to prove (or provide publicly available evidence for) who committed the attack on Snizhne on July 15. But we may be able to determine from which direction the attack came. – If this was a Ukrainian attack, the supposed target was 300 meters away, which would mean a military blunder. Not likely to be the case. – Andriy Lysenko claimed they were not flying that day, and the reason was plausible : The day before a plane was downed along the Russian border, and the fate of the pilots was still unknown. Also, Lysenko is not ever been caught lying, while his counterparts at the Russian Defense Ministry lie all the time, as witnessed by Bellingcat’s reports. – The Snizhne attack was heavily promoted on Russian TV as another example of Ukrainians shooting at their own people. Which they do for EVERY attack even if fact-checkers (like ukraine@war) showed convincingly that the fire came from Russian controlled area. The scary part is that IF this was a Russian false flag attack, then it may very well have been committed to make the residents of Snizhne welcome a BUK system that would arrive two days later. A BUK system that killed 298 innocent people. Rob, nice try, but check chronology. 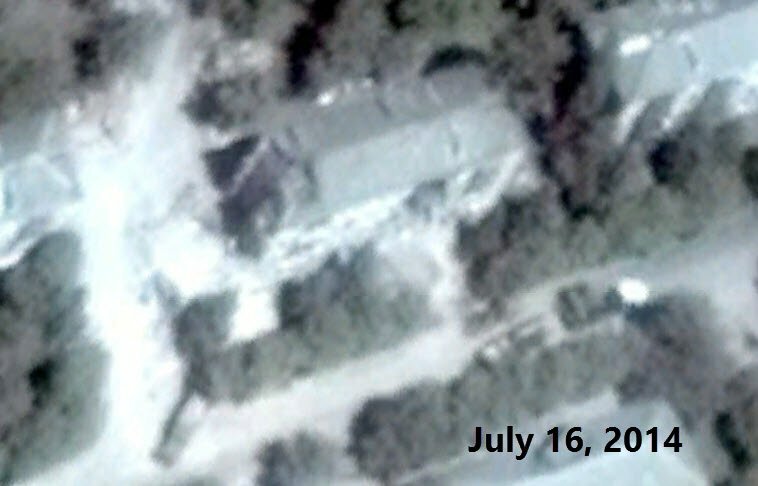 The building in Snezhnoe was destroyed on 15 jul, the Ukrainian Su25 was shot at a high alt 5.2-8.2 km on the 16 jul, after which Lysenko announced no flights on 17 jul when Boeing was shot. 3 sequential days. So we may assume Buk appeared there because of previous Ukrainian raids. Btw Su on 16 jul was shot at the alt unreacheble for hand held IAM, there should have been something heavier, may be that exactly Buk? Buk missed one missile, why do you think he didn’t spent it for Su on 16 jul. And what motherf..r sent rebels an SMS saying An 26 should fly on 17 jul and gave MH17 direction instead – that is the question. It was Ukraine who alway blamed Russia for own crimes. This time is not an exception. I understand you want to defend your Ukraine, but don’t lie for that, truth is easy to tell, truth will always win. And since the fate of the pilots of that AN-26 was not yet determined, Ukraine was NOT flying on the morning of July 15 when the Snizhne attack occurred. They might have said so, doesn’t mean they didn’t. Another couple of Su were shot on 16 jul. Anyway give a link to the official statement of no flights on 15th, published before 15th, not afterwards? This is taken from the July 16 GoogleEarth (WorldView) image at 48.019230°N, 38.757507°E. Now, how did that hole in the south wall come about if the attack came “from the west” as the NYT article suggests ? To me, it looks like the attack must have come from the South to make a hole like that in the South wall of that building. In the same way Ukraine denied other destructions and victims at Donbas. “They are firing to them themselves” became a men. Yeah, right. Tell that to the the people in the Mariupol attacks, and the Volnovakha checkpoint attack, and Kramatorsk, and Artemivsk, both attacked with cluster munition, and in Donetsk, against the very people that these “separatists” claim to protect, the deadly attacks on school 63, and the Leninsky bus stop, and the Jan 30 mortar attacks, ALL of these CLEARLY were fired from Russian controlled areas. Tell that to the citizens of Slavyansk, Kramatorsk, Gorlovka, Donetsk, Luhansk. Where Ukraine used avia bombers, tanks, heavy artillery, grads to fire on those cities disregarding the civilian casualties. How many civilians died – 2000? Because Ukraine wanted to fight away rebels from their cities. That is NOT a symmetrical case. You give just particular cases against the systematic killing of own civilians civilians. “both attacked with cluster munition” you probably confuse with Syria. What cluster munition in Ukraine? But grads and Uragans are even worse. OK. Tell me ONE specific example of Ukraine attacking “citizens of Slavyansk, Kramatorsk, Gorlovka, Donetsk, Luhansk.”. Are you kidding?? Google the pictures of destructions in those cities. I’m saying the destruction of Donbas and killing of civilians was systematic, not several picked up examples. The rebels didn’t advance to capture cities and towns. Mariupol was revoked immediately after the yelling in western press. May be even the fire on Mariupol you refer was a provocation. The rebels defended own cities which Ukraine tried to capture using inappropriate weapo. Yes. Caused by Russian attacks, as I pointed out for 7 explicit cases which were clearly fired from Russian controlled areas. Now once again : Show me ONE case where the destruction was clearly caused by Ukrainians. I bet you CAN’T, because there is none. Interesting, how killing of civilians in Slavyansk, Gorlovka and Kramorsk are related to the particular and no so damaging inside you refer to, if you incidents happened much later, when Donetsk was already beseaged by Ukrainian army?? You were able to give those examples because they were specifically picked up and turned into propagandistic picture for the west. Many of them are still arguable. Poroshenko went to US with the cut piece of that bus stricken by the blast. Rebels don’t work for propaganda, also because it would be useless. May be this event became a mem. Did your hear about Gorlovskaya Madonna? Enjoy, that was after the Ukrainian artillery tried to target an administrative building it Gorlovka in the very beginning of this conflict where civilians didn’t even perceived it as a war or danger and freely walked in the streets. That is that the example you asked for. Satisfied? But I said that the very idea to through army agains own rebellion region was a crime. And that Ukraine systematically fired w/o target to cities and other densely populated areas. That is a systematic crime verses you several negligible by the contrast to all other cases. Yes, I heard about the Gorlivka madonna. Yet it remains unclear who fired the GRAD missiles. That was NOT a grad missile, that was artillery shells. They were targeting the IAB building on the rebels territory.The case was clear. The rebels detained Ukrainian artillerists who were responsible. Stranger, you don’t KNOW that Ukrainians fired the shots. You are just repeating Russian propaganda, but they present no evidence. The issue is that the Gorlovka attach that killed that lady and her baby is similar to the 7 attacks (killing 96 people in total) that VERIFIABLY were fired from Russian-controlled areas. The pattern is this : Shoot up some civilian targets, blast the casualties on Russian TV and media, and blame Ukraine for it. It’s all part of Russia’s dirty war in Ukraine, and MH17 is a part of that. Same mechanism, same lies, same blame on Ukraine. Just BS, I don’t know what to say else. I saw the interview with the people who participated there where they captured Ukrainian artillerists who fired on MVD/MIA building. That what Ukraine is doing – they are firing on themselves, they besiege themselves, to put all blame for Russia at least verbally. “Russian propaganda” have enough of real cases of Ukrainian and volunteer battalions atrocities documented by OSCE. What other 96 victims are you saying if 2000 are dead by now? That is 96 victims proven to be killed by fire from Russian controlled territory (394 if we add MH17), and 0 victims proven to be killed from Ukrainian controlled territory. These pictures clearly show cluster munition being used by Russians against Ukraine at Artemivsk. Weary at despairing of the willingness of some to dismiss out of hand the stack of evidence that puts the Russians firmly in the dock while playing up the flimsiest of fig leaves that creates another smoking gun – I have resolved to find it amusing instead. “But there are peoples witnesses they heard Ukrainian jets even on the 17th.” I believe their might have been as many as seven (7) people who stated they saw or heard what they thought/presumed/were sure was a military jet (or jets) on the day. Those who still play this up ignore the 100+ who state they either didn’t see any other aircraft or can confidently state there were no other aircraft present -and these are people who live in an area assumably broadly sympathetic to the rebels. Then there’s also the fact that the late-in-coming Russian radar also confirms there were no other suspicious aircraft in the area. Aha so it is not a russian occupition, local people support the rebellion?! They are sympathetic to the rebels? And all cats’ investigation is based on Ukrainian Security Services SBU records. Remember how the cats researched the Russian sat image with that frequency analysis and epic failed. But still they could have at least try a frequency analysis of those records to find point of mount and validate authenticity. They never tryied, they review anything from Russia under a microscope and take everything from Ukrainian special services for granted and don’t ever try to validate. “Aha so it is not a russian occupition, local people support the rebellion? !” Who said anything about an occupation? Incursion stranger. Try incursion. Better again try belligerent incursion. Besides it wouldn’t matter if the viewed the Russians as their liberators. There’s a thing called Rule of Law and the Russians know full well their offside of it. Otherwise they wouldn’t bother their holes with all the cloak and dagger stuff sneaking gear and men in and out. Also I described the locals as likely ‘broadly sympathetic’ to the rebels. I’ve nothing to base that on other than this is Eastern Ukraine we’re talking about. And even if they are -a lot of people up the road from me in Northern Ireland are ‘broadly sympathetic’ with Irish Republicanism -it doesn’t mean they support or supported the actions of the IRA. Yes. Nevetherless that means locals support the rebels and Russia and rather blame Ukraine who came to bomb them. May be in the very beginning it was like you describe, but when real blood shed started and 2000 civilians died, locals took rather rebels and Russian side. Many times from the highest official Ukrainian side it was called Russian occupation and claimed they are fighting Russian regular army. Imagine England sent aviation, tanks, artillery to finally get rid of IRA in military way and started to bomb and shell Irish cities, what would most of Irishes feel? They would rather support all their against all who came with a sword. Difficult to imagine, but more or less that is Ukrainian reality. Donetsk the largest city is really all under fire which can start any time unpredictably, one town or other the shell may come at any time. Schools, hospitals nobody care. The civilians are really under constant threat from Ukrainian fire. The rebels fire too but try target only Ukrainian positions and they just stay, Ukraine craling forward, the rebels would not fire if Ukraine didn’t attack. The rule of law – sounds great. The rule of law says Ukraine may use any weapon except those of mass destruction to target rebels everywhere, even in cities, even in densely populated areas, even by massive fire grads systems. The 2000 civilians are just “collateral damage” and everybody else who will be killed just in all the mess. Right? …only to the chaos. No any western principals or laws are actually working. There is the rule of law and rule of moral. Which is far not the same. Though I agree to anything you would answer. Still the rule of moral matters even though that is much more ambiguous and volatile matter. stanger, you claim that Ukraine is responsible for the destruction in Donbass, yet the evidence suggests that Russia is bombing Ukraine and blaming Ukraine for it. Bellingcat has recorded hundreds of such bombings, and specific bombings are analysed by other fact-checkers as well. This is school 63 in Donetsk, where two teenagers lost their life. The attack came clearly from Russian-controlled area. Rob, you are getting farther and farther from reality. You are writing with an accent. What is your original language? You’re getting farther and farther off topic and your contextualising the Russian/rebel response, as you see it, reeks of whataboutery. Russia doesn’t get to sneak a SAM launcher across a border, fire a missile into one of the worlds busiest trans-contintental air corridors and then shrug their shoulders at the resulting horrific loss of life and claim none of this would’ve happened if Ukraine hadn’t been jerking them around –which is about as close to an admission as they’ve gotten. Your Irish analogy is lumpen and clumsy -let me try straighten it for you. Following the hypothetical events you describe the (actual legitimate) Irish Army, decide to assist the (paramilitary, non-state grouping) Provisional IRA and smuggle a BUK missile launcher over the border into Northern Ireland where they accidently shoot down an airliner. In a state of panic the IRA claim the airliner was shot down by an RAF jet. Witnesses come forward and, in an area considered supportive of the IRA, just seven of them give versions of events that in any way back up the IRAs version of what happened (including one who subsequently admitted to Reuters he’d been coached). Worse again –radar data from everywhere and everyone, including from the recalcitrant, un co-operative and vexatious Dublin authorities, confirms there were no military aircraft present. ttb, whoever you are there, please curb your nasty manners and try to keep a constructive and respectful discussion. Don’t pretend to be less smart than you are. Thank you. Donbas was the area of air figting. Every day Ukrainian combat jets flew to bomb the rebels positions and produce collateral victims. Many of them, at least shown in DSB report, were shot down by rebels. Everybody knew the rebels have anti aircraft missaleses. Hand held in the beginning with the cealing may be like 3km. Ukraine closed the skyes for civilian aviation up to that 4km or so. On 16 July one day before the catastrophe (!) Ukrainian jet was shot at a higher altitude like 6,5km. Ukraine was concerned and reportedly temporarily withdrawn further flights. Ukraine immediately closed the sky up to like 9.5km. According to their official press conference Ukraine knew the rebels possessed buk. I believe even 2(!) buks were announced. Russian television announced the rebels would be defending with a buk. That is all before the catastrophe. Now the question, why did not Ukraine closed the sky to a higher altitude where all commercial liners are flying? Not to loose commercial income? And if rebels down it, that would only serve Ukrainian targets? It’s interesting to note, Russia also issued a standard warning in the system used to trace a route for all avia companies in the world (forgot the name) for own adjacent areas up to the same like 9.5 (I don’t remember correct numbers, the correspondence between them is important) but also lower than commercial flights fly. And just a day or so before the catastrophe, Russia added some comment to this warning, but didn’t correctly issued a new one, saying a much higher altitude to close. Strange.. The Malaysia avia company tracing the route using this warning system in an automatic mode didn’t ever noticed a lower restriction and potential dander, because the sky at Crimea (!) was previously closed by the west as a annexed area, but Donbas where avia fighting was going was not! Malaysia had to diver to the north up to Donbas. Avoided the closed peaceful Crimea and got caught at open Donbas war zone. So that is also a question why the sky was not closed at the aria of air fighting. As for Irish IRA analogy, I just wanted to show you that Ireland is not Donbas and the situation is different. I gave you the situation in Donbas in terms of Ireland. You further analogy with Boeing is the same ridiculous as mine. That’s it, no any other here. Dry yer eyes Stranger. This is a big boys website –and in any event I can’t see where or what I’ve written anything that you could find disrespectful. In any event you’ve now fallen into the pit deniers usually end up in – the victim-blaming, wife-beater logic of “it’s Ukraines fault for not closing their airspace”*. So far as I can see Ukraine played it by the book with regards it’s airspace. It was entitled to try and keep its airspace open, can ill afford to forego what I’ve read might be €2billion in overflight payments and could be accused of ‘caving in to terrorism’ in the event it unilaterally stopped all flights. Returning to the Irish analogy for a moment if the principal were applied here that the threat of an attack must result in closing the route we shouldn’t have had a Dublin – Belfast train service since about 1965. There is no precedent I can think of wherein a non-state grouping had this class of weapon put at their disposal. More likely though was that, despite the viciousness already seen in this conflict, not in their wildest imaginings did they think some abject loon would fire a SAM into L980 through 50%+ cloud cover at a target they evidently hadn’t ID’d. That they appear to have sat around the place for around 3 hours before firing only fuels my suspicion there was alcohol involved. *There are questions I would like the Ukrainian side to answer and I’m sure they’ll have to explain when this comes to court. I’d like to see the claims of Vadim Lukashevich explored further. Namely that Ukrainian authorities arrested an individual that afternoon at Dnipro airport after he allegedly signalled to seperatists by text the departure of an An26. I’d like to know what those Ukrainian authorities did next if indeed they did anything at all. No that doesn’t work like that. Let’s refer to our bible – DSB report. States publish NOTAM messages describing any possible hazards at a specific area and other information to international Aeronautical Information Publication (AIP) System used by all flight operators to trace the route originally and monitor the conditions along the route. No reaction. The very next day Ukraine claimed to stop all own military flights and the Boeing catastrophe. So Ukraine have never closed the alt FL330 where MH17 flew. Malaya and other flight operators automatic routing system didn't trigger a alt match, the routed the trace w/o knowing of anything above. own adjacent territory and one was very fancy if pointed out FL330 but is comment or so, so the auto system would not notice. I believe FL330 means 33000 feet or 10.058km, where MH17 was flying. "Ukrainian authorities arrested an individual that afternoon at Dnipro airport after he allegedly signalled to seperatists by text the departure of an An26." Wow, that is interesting, what date it was, I hope not 17 jul? So texted on An26 and gave the route of MH17 instead! Fk, what if those authorities took the separatists phone number he sent SMS to and sent a fake message about another An26 by giving MH17 direction? Good conspirology! But seriously Buk could have waited for something they thought should have flown from that direction. Give your link please. Where exactly did you get the quote from ? It’s not from the Dutch Safety Board report. Rob, that was written by ttb two comments ago, reportably Vadim Lukashevich claims that. This entire story supports – as other stories do – the inclination of official Ukrainian sources to be involved in cooking up false flag narratives to blame Russia and get NATO involved in a war against Russia. Since the Ukrainians were not flying on July 15, who made the attack on Snizhne July 15 ? You are elevating a statement after the fact from a dubious source to a dogma. There are a lot of radars there civilian and military. Do you think a Russian jet could have been unnoticed. Apart from the fact that the Donestsk airport radar was bombed by ‘separatists’ the day before, and thus that for close targets, Ukrainian radar was rather blind at the time, don’t you think that if this was a Ukrainian fighter, that the Russian radars would not have picked it up ? I don’t know did Russian radars see the Ukrainian air activity. Probably. Why would they share with public? There were a lot of Ukrainian anti aircraft complexes with military radars over there. I don’t think they would neglect a possibility to hummer Russia via the western press if something. Russian aviation was never ever seen there so that would be a sensation. In the same way I see no any necessity for a single lone Russian jet to target a civilian building in Sneznoe probably under the rebels control. A concentration of Ukrainian forces would be a more logical target. Ukraine tried to fight rebels out from their cities and densely populated areas, not vice verse. Which evidence do you have for how close the nearest Ukrainian anti aircraft complexes where ? I guess, because Ukraine does have them and closing their eyes on the air above Donbas and above the Russian border would be unconcern. Anyway a better guess than your Russian jet. What was the reason for that, you give just official Ukrainian lie. Why Russian? Because Russia is always to blame and Ukraine to wash out white. For example we’ve seen an Ukrainian TV program showing the Ukrainian buks with heave radar systems somewhere in the region of Kramators or that side. Could those buk support radars see Snezhnoe up to Russian border? Needs to calculate. Could there be buks or other radars in other places? Likely. That would be Kramatosk FYI. Which is more than 100 km from the MH17 crash site. Likely beyond the reach of their radar. Kramatorsk is about 120 km from Snizhne. Clearly out of range for BUK radar. So Ukraine could not have seen a Russian fighter on July 15 attacking a civilian target in Snizhne. Well first of all according to Wike the range of buk supporting radar(not telar itself) is at least 100 km, second why do you think Ukrainian buks and radars were only where Ukrainian tv showed them once? But we stared from debunking your claim based only on ukrainian lie, that it was Russian jet. No any other reasons to believe that, neither witnessers nor the whole logic of conflict. Btw Ukraine said it was “an unidentified jet” they never mentioned Russia, ” Russian jet ” appeared only on social media.
)) do you follow your logic? Your “logic” implies Ukraine has only one base and buks only in one place which was shown on public television? But anyway, we started from: there was NO ANY Russian jet there. That was your original statement followed by this discussion. Give us the sources where did you get that was the Russian jet? If it just your guess, what logic your guess is based on? Your argument seems to be that the Ukrainians must have had some radar that could detect the July 15 fighter, but the evidence we have suggests that Ukrainians could NOT have detected them (being 120 km away). However, Russian radar systems claim to be able to detect even a BUK missile over Snizhne, so these Russian systems surely would have detected (allegedly Ukrainian) fighter plane over Snizhne on July 15. Yet not a peep out of Russia on this incident. My argument is that Russia didn’t have and couldn’t ever have jets there. If you claim that you need any evidences or at least reasonable considerations. stranger said “Russia didn’t have and couldn’t ever have jets there”. Of course they could have jets there. It’s only 10 miles across the border. That’s an easy flight, and more interestingly, it is within the reach of BUK communication between a TELAR in Snizhne and a command vehicle in the Russian Kuybyshevo area. Rob, if Russian jets were there in Ukraine, your new nationalistic anti Russian regime would be kicked of Kiev in a couple of weeks. Russia doesn’t use force other than helping the rebels to keep their ground. Russian jet there would contradict all spirit and logic of this conflict. Moreover you have zero evidences just none to claim that, even official Ukraine didn’t call it Russian jet, they said an “unidentified jet”. If it were Russian indeed Ukraine would not call it so. The Russian propagandists here would love to drag you down into the weeds of nebulous and derivative debates that can never be resolved. In the context of Putin and his generals and rebel leaders claiming at the top of their voices that they have no Buks, you could show them multiple videos/photos with exact geolocation deep in rebel territory and they will still claim ‘there is no evidence’ – or will blame Nuland, etc., or fret about NATO aggression. Ukraine was definitely bombing rebel positions. There is no point in haggling over which days or which models of planes or ordinance. Rebels were firing rockets/shells and blowing stuff up too. Its a war. The key issue Russia has been trying to hide is the fact that its chain of command is involved directly in starting and sustaining the war against its neighbor Ukraine. The buk is just more evidence. CFL Whom did you call Russian propagandist, moron, me who is not living in russia or Mr. Bushkin or other few rare commenters. You idiot, just read what I’m writing. I told nothing from what you ascribe me. Moreover all comments of critics here including myself and some others makes more sence that other regular commenters yelling and whining. You at least try to understand what exactly people try to say. Or come to see your psychiatrist, as I have advices to you. So you claim Khmuryi /Petrovsky is Dubinsky, but that on itself does not give any better insights in the SBU tapes. Nonetheless in this article these are taken over at face value except for the parts that are so clearly wrong you have to invent some work-around to make the rest fit the narrative. Is it clear at your own desks the analysis as written down here contain giant leaps to conclusions and uncritical reference to SBU rendering of the intercepts? Interestingly “Today the second” [plane allegedly downed on the 17th] is purported to be a mistake made by Khmuryi, but of course a scientific approach would entail assessment of other possibilities. More acceptable would be a scenario in which the SBU spliced and edited these parts of the tape using different conversations from different dates and so also misdating the produced conversation -as they obviously did with other tapes. However, Bellingcat chooses to endorse the entire SBU narrative based on the intercepts now, only after two and a half year. Why only now? In that case it would be interesting to see how Bellingcat could match the story of the Chernukhino launch into the bigger picture, a SBU story of a presumed “confession” already issued 5,5 hrs after the crash. Hm, why did they miss so important evidence? Bellingcat is deaf and silent to your critics and doesn’t care as long as they can produce sensational material, but actually just reprint the work of others. The errors and garbling as well as ignoring not fit material and pushing the evidences into the predefined theory doesn’t hurt their popularity and salaries so far. So why change? Unfortunately they copied my “confession” of “Bad” on the glav.ru forum, but without the warnings attached to them. Cherry picking? To Bellingcat team. Thank you guys you doing great job, making clear evidences. Bellingcat, you guys are amazing. Without your work we would not very little about what happened on that dreadful day July 17, 2014. Thanks, Alex and Rob, for the compliments. I have to ask what kind of intelligence service advertises that it’s tapping phones by putting the recordings on youtube. The one that wants to deliver a first strike to start up an information war to get to the hearts and minds of useful audiences. This all seems to have been meant to stage a trial by media. I have followed all Bellingcat reports since 2014. The editorial says nothing about Dubinsky using the name Petrovsky. So the SBU gets the name wrong, date of birth wrong and promotes him to major general from colonel. bellingcat’s explanation is that the wrong date of birth is just a mistake, that Dubinsky must have been calling himself Petrovsky while in Donbass and the incorrect rank was a new rank given to him by the rebel forces. It seems what’s going on here is making excuses for the SBU’s dodgy information, more than anything else. An example of SBU record amateur frequency analysis. Not ideal, but the right way to go. Preferably the other records would be cheched for points of cut and mount which are possible for phrases in the same conversation or even for separate parts inside the phrase. The voice authentity analysis should be done also – is it belongs to the person and isn’t it an actor’s voice. That is what can confirm validity of those evidences. Unfoturnatelly Bcats analyze only Russian evidences and believe every crap coming from Ukrainian special services. But that is the personal interest, you know, career, fame, money for mortgage. You /Inform Napalm etc say Dubinsky is aka Petrovsky. He has never said he was using the name, nor has the anon person posting as Petrovsky on the forum claimed to be Dubinsky. I don’t think you have identified Dubinsky as aka Petrovsky except in your own minds. Do you guys have any information on the relationship between Dubinsky and Igor Bezler ? The question is : Was “Naimanets” a real spotter, and was Bezler really in the line of command, or is this call a fake, and real command to launch the missile went via another channel ? The point is : If Dubinsky (Khmuryi) claims that this is “my BUK-M” then what is the role of Bezler in the chain of command ? According to all the ‘tapped calls’ put together, the BUK is everybody’s and nobody’s and in more than one location at the same time. Schrödinger’s Buk. It exists only when and where one observes it. Russian Quantum Mechanics. There is a connection between Dubinsky and Bezler via ‘Botsman’, a person who very likely was the deputy of Bezler. However, we do not have any information who ‘Naimanets’ is. It is not to us to decide if the intercepts are real or not, although we don’t have reasons to believe they are not, as they correspond with the timeline of the events, supported by videos, photographs and messages on social media. Why you cannot do a simple frequency anylysis of the phone call records? That might potentially show the points of cuts and mounts, and glueing together of inconsistent pieces with different noise patterns. if it isnt up to you to decide if they are real or not why are you concocting stories around them as if they are real? Why didn’t you put a large alert-disclaimer in the beginning of your articles saying what you’ve just told us, that you cannot/dont want to establish the validity of the records and are not sure?! Another question, why when it comes to blame Russia, you investigate under microscope the minor thing you can catch to. But as for the evidences from Ukrainian special services, you mostly take it for granted? What is you strong prebias against Russia is based on? Another one pls. We’ve heard b/cats are financed by Google, Soros’ fund and a number of other funds. But we’ve figured out 2guys employees of B/cats are not doing research themselves and reprint third authors like yourself for example. Who finance those authors in turn? And more particularly who financed you, if you are the author of this article? Please don’t leave those critical questions rhetorical, would appreciate to hear the answers, thanks. You were so eager to prove Russia is guilty for humanitarian convoy bombing when this argument was used by your governments to hummer Russia in UN to defend the rest of their armed proxies hiding in Aleppo. Then the UN investigation proved Syrian army is behind that bombing and Russia is not guilty! Why didn’t you publically apologize to Russia and didn’t publish the official statement of denial? Thank you Daniel. That makes sense. The conversation itself lasts 30 seconds, and the flight time of the missile was some 30 seconds too. This leaves only 60 seconds for Bezler to “report to commanders”, to switch the TELAR radar on, to acquire the target, to lock into the target, and to press the button. Which is a pretty tight timeline. Seems to me that either Bezler was in direct contact with the TELAR in Snizhne, or Bezler was not in the chain of command, and the whole call was fabricated to make it look like the “separatists” were involved. and of course the intercepts dont correspond accurately to real events. there are numerous problems with them. for example the Buk is specifically ordered to go with the Vostok tank convoy. Ukraine tried to present the story that it did, using a still of the Buk from a video and a photo of a Vostok armoured truck. But we know the Buk did not go with any tanks. so what’s that about? We can also recall the very first call interception of SBU where it was said “Chernukhinskie” shot down the Boeing, which clearly contradicts to all further records mixes. Yes. The “separatists” don’t know s**t about what’s going on. That’s because the Russian military was doing all the work. Also note that Bezler was in charge of Horlivka, and NOT “Chernukhinskie”. So either the separatists don’t know s**t about what’s going on (since Russian military pulls the strings) or Bezler was not in in chain of command for the MH17 downing (and thus the call to Bezler was fabricated). Really? why would the separatists be giving orders/spotting planes then? Why bother presenting the wiretaps if they are meaningless?